I mentioned in an earlier post that I had acquired a very rare Apple AppleVision 850AV 21” monitor. Debuting in 1997, the 850AV was a high end, nearly 80 lb. bruiser of a display with a hefty $2,000 price point. The 850AV could be run at resolutions all the way up to 1600×1200 with a 75Hz vertical refresh rate, and featured integrated speakers and microphone. It was nearly the highest of high end in its day. In March of 1998, Apple rebranded the AppleVision 850AV to “ColorSync 850AV”, saying that this new branding “more effectively communicates the advantages of the systems’ color calibration capabilities to customers”. Later that year, in November, Apple discontinued the ColorSync 850AV. Given its short market run and its high price point, I am guessing that the 850AV was not a strong seller – I have only ever seen one on eBay in years and years of watching. Happily, I was fortunate enough to win it and am thus able to pen this article about it, many years after its heyday. The AppleVision/ColorSync 850AV had one particularly interesting characteristic – it could only be configured via the Mac OS Monitors control panel. Absent that control panel, this massive display defaulted to using only a limited percentage of the available physical screen real estate, and could not be further adjusted. It pretty much defeats the purpose of using a physically expansive 21” display when only a limited portion in the center of the display is in actual use! I know this because even though I acquired this display as part of a system that included a Power Macintosh G3 tower (upgraded with a 450 MHz G4 CPU accelerator) for whatever reason, this system simply refused to execute the Monitors control panel successfully. Efforts to do so usually caused the Mac to freeze, and required a subsequent reset to restore order. SO… I had acquired an incredible display, but I had no idea if it would actually perform, since it steadfastly refused to take advantage of the full available screen real estate when run. Taking advantage of our recent move and the progressive unpacking that is occurring, I was able to pair this display with a different system – my Power Macintosh 7300/200, itself upgraded with a 500 MHz G3 processor – in hopes that the Monitors control panel might prove to be more cooperative in a different environment. I connected it up, booted the 7300, crossed my fingers and held my breath, and selected the Monitors control panel. I was delighted when it executed without crashing! Now as you will all know, the Monitors control panel is normally the place you go to adjust the color depth and the resolution of your display. In fact, what you are really controlling this way is the settings of the video controller on your Mac, not the display itself. However, the inverse is at least partially true when a monitor like the 850AV is connected to the Mac. The word “connected” needs a little exploration in this context. 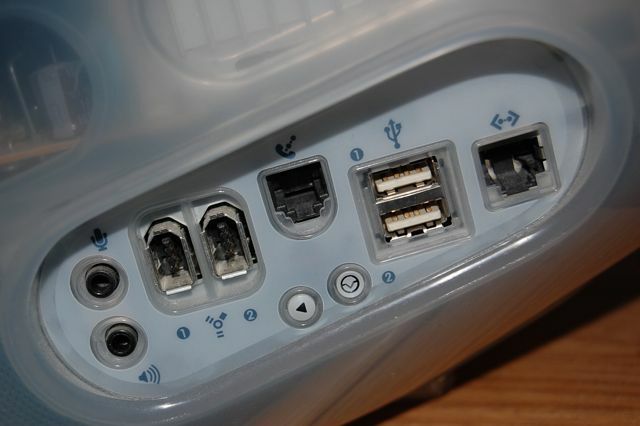 In a typical Mac system, there is a single video cable connecting the monitor to the video output port on the Mac and that is that. Monitors like the 850AV extend this by including a second connection from the monitor to the Mac, this being an Apple Desktop Bus (ADB) cable. Widely used on almost all Macs from the Apple II GS in 1986 all the way through the “Yosemite” Power Macintosh G3 in 1999, ADB is a low speed serial bus supporting daisy chained devices. ADB is reputed to have been invented by none other than Steve Wozniak himself. ADB was largely used for keyboards, mice, joysticks and the like, but the 850AV put it a new use – monitor control. You can see key new additions of Contrast, Brightness, Geometry and Monitor Sound selections, each of which allows you to directly control the indicated aspect of the 850AV’s behavior. The Geometry selection is truly key with the 850AV, as it is the sole way of adjusting the screen display so that it fills the physical display surface from edge-to-edge, something which is highly desirable in any monitor, but especially desirable when you have paid a LOT extra to get the larger screen real estate of the 850AV. However, in addition to this, a full set of other geometry related controls is provided. These include actual screen geometry (Height/Width, Position), Pincushion adjustment, display image rotation within the physical display area, keystone adjustment and finally, parallelogram adjustments. A Degauss control is also presented. You certainly won’t use that function every day, but on occasion it can be useful. If you are reading this and don’t recognize the purpose of some of the controls mentioned above, you are lucky enough to have not had to deal with some of the older, more finicky CRT monitors! Moving from left to right on the Monitors control panel, the Color control set is next. This lets the user undertake a lot of the usual color adjustments needed to ensure accurate color reproduction on screen. Controls are included for White Point, Gamma and Ambient Light level. A Recalibrate control is also included, which will guide you through a manual color calibration process. This is a fairly rudimentary approach to color calibration, and while it may get you into the right neighborhood, it will not dial in perfect color reproduction. To do that you need a hardware color calibrator accessory. I have acquired two of these for Mac OS at this time, and will post a future article on them and their use. Finally, there is the Sound set of controls. These controls support adjustments to the Volume, Bass and Treble of the 850AV’s built in speakers. The 850AV also sports a separate headphone jack, and its volume can also be controlled independently of the speaker volume – a nice touch. Finally, the Sound controls also allow the user to enable/disable the built in microphone on the 850AV and control its input volume/gain. That completes a quick tour of the Monitors controls that are unique to monitors like the 850AV, which sport an extra ADB connection back to the host Macintosh. As I mentioned above, I have the 850AV connected to my Power Macintosh 7300, and have it set for a resolution of 1280×1024. I am loving the extra display space, but I have to admit that due to the added height of the speakers at the bottom of the monitor, the display area itself sits up a little higher than I find comfortable. 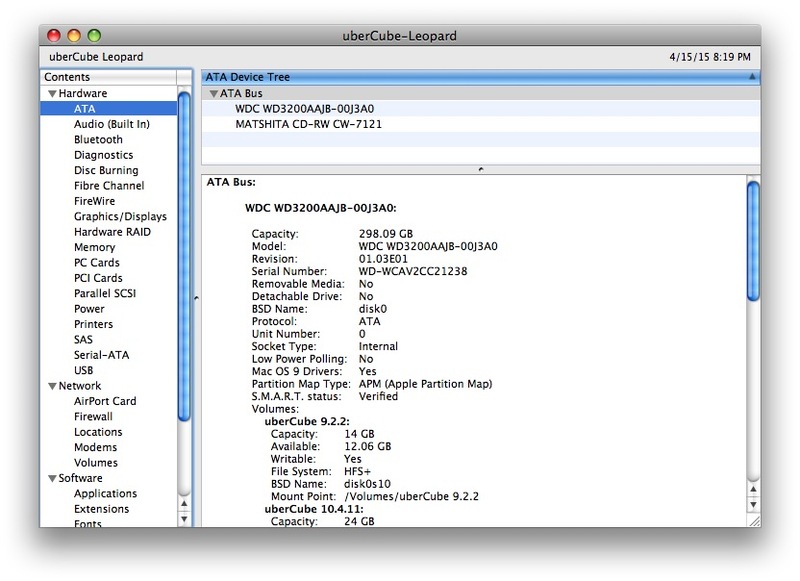 By the nature of the Mac OS GUI layout, with the menu bar along the top edge of the screen, the user is forced to interact with the very top of the display space quite often. I find myself having to crane my neck up to do this, and that becomes uncomfortable after any extended use. I either need a lower surface on which to place the 850AV, or I need to lay hands on its lesser sibling, the AppleVision/ColorSync 850, which is fundamentally the same display technology but without the speakers. I am on the hunt for an AppleVision/ColorSync 850 now, and will report on it here at HappyMacs if I should acquire one. Until then however, I would absolutely recommend the 850AV as a great addition to your vintage Mac setup. The extra display space is more than worth any other considerations. Keep an eye on eBay if you are looking. They don’t come up often, but they do come up. Happy Hunting! Underlying this blog is my long held belief that just because a given technology is now older does not mean that it is now obsolete and of no further use. Older technology delivers the same valuable functionality today that it did when it was shiny and new, and it can still be used to enhance your life today just as it did years ago. 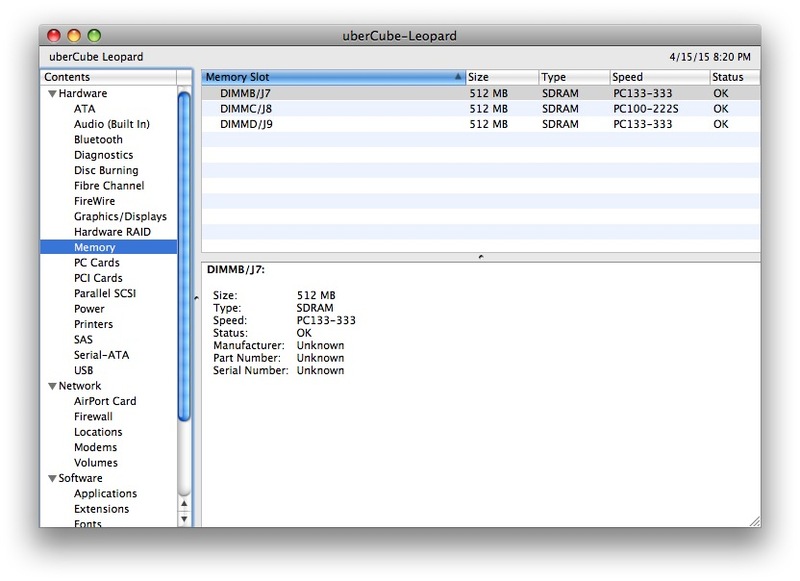 A case in point is Mac OS X Snow Leopard (10.6.x). Some time ago in this blog, I penned a piece called “Everything Old is New Again”, praising Apple for extending Mac OS X Mavericks support all the way back to my aging 2007 MacBook Pro, allowing me to refresh it with the latest and greatest version of Mac OS X that Apple then had on offer. This seemed like a great idea at the time, and it still is not a bad one, but Mavericks was four releases later than the Mac OS X Leopard that my MacBook Pro arrived on the doorstep with. Those four releases had incorporated a lot of new functionality, and a lot of new code, and Mavericks was just a touch slow on this increasingly vintage hardware. I accepted that as the inevitable price of progress and got on with it. Mavericks was slow to start up, but once it got its legs under it, it was decent enough to work with. Over time however, as always happens, it seemed to get progressively slower. None of my usual maintenance routines could reverse this trend, and eventually, this past week, I started to notice a 2+ second launch delay for pretty much any application I might chose to launch. On top of the generally sludgy behavior of the machine, this was just too much. Enter Snow Leopard. It was the next Mac OS X release after the Leopard that had graced my MacBook Pro when it was new. 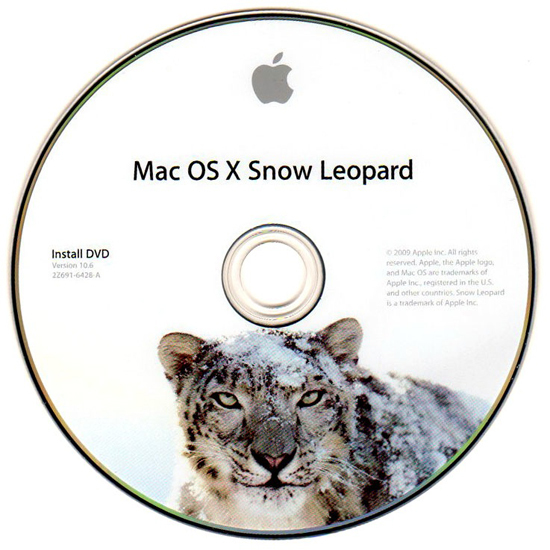 At the time of Snow Leopard’s release, I was hugely disappointed with both Apple and with Snow Leopard. The reason will be a familiar one to readers of this “Pre-Intel Mac” blog – Snow Leopard did not support my beloved G5 main computer, which became effectively, and for all time, stranded at Leopard. 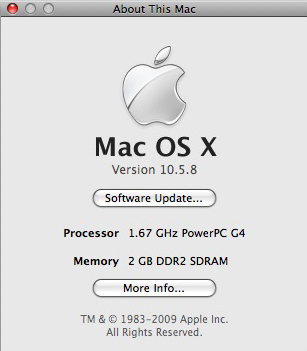 I did eventually upgrade from the G5 to a Mac Pro (an Intel machine) and it came preloaded with Snow Leopard. It seemed useful enough, and wickedly fast, but I never loved it, or Snow Leopard, like I had loved my G5 and Mac OS X Tiger. Eventually, I upgraded the Mac Pro to my current “daily driver”, a 27” iMac now running, you guessed it, Mavericks. That left me with a lightly used set of Snow Leopard install disks, which gathered dust from then until now. Faced with the Mavericks slowdown on my MacBook Pro, I took a fresh look at Snow Leopard. I remembered that the release of Snow Leopard marked one of those truly unique moments in computing history. When was the last time you heard of a major new operating system release whose declared purpose was not to add gigabytes of clever new features, but rather to streamline, optimize and reduce the footprint of the product? That was Snow Leopard. I do recall being particularly impressed with Steve Jobs at the time, thinking that only he would have the guts to pull off such a move. He did, it succeeded, and rebased on this smaller, smoother and faster platform, Mac OS X launched forward into the Lion, Mountain Lion, Mavericks, Yosemite and El Capitan releases that followed it. Smaller, smoother and faster – these were just the attributes I was looking for to breath new life into my struggling MacBook Pro. I got out those nearly forgotten Snow Leopard install disks, dusted them off, and put them back to work. Yes, I downgraded my MacBook Pro from Mavericks to Snow Leopard, and I could not be happier with the result. The machine is now wonderfully responsive once more. Applications spring into life in a heartbeat. Gone is that annoying 2+ second application launch delay, and gone as well is the lengthy, lengthy wait for the machine to boot up. It is like a new computer again. I am so pleased. That’s the up side. What’s the downside, you ask? What have I had to give up to accomplish this renewal? Well… effectively, not a whole lot. I have all the same applications loaded, albeit older versions of a few, and am 100% current with today’s web via the good offices of Firefox and Thunderbird, whose current versions execute perfectly under Snow Leopard. I have lost the ability to sync my latest iDevices (iPad, iPhone and so on), but this is not an issue, as these are homed to my 27” iMac anyway. So, really, I have lost nothing, and in return I have restored the youth and vigor that my MacBook Pro had on the day it was new. 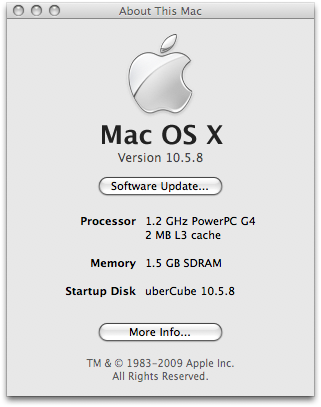 The machine is now 8 years old, and thanks to Snow Leopard, I may just get another 8 years out of it. To wrap this up then, lets return to where we started. 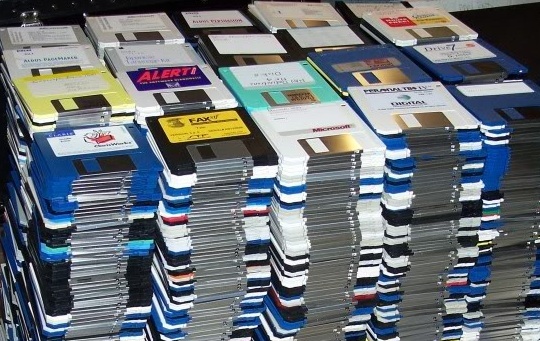 Just because it is old does not mean that it is obsolete. Reloading an older Mac OS X version (Snow Leopard) onto an older platform (a 2007 MacBook Pro) has delivered a fully functional, incredibly fast and very much non-obsolete laptop that will now continue to serve me well for years to come. 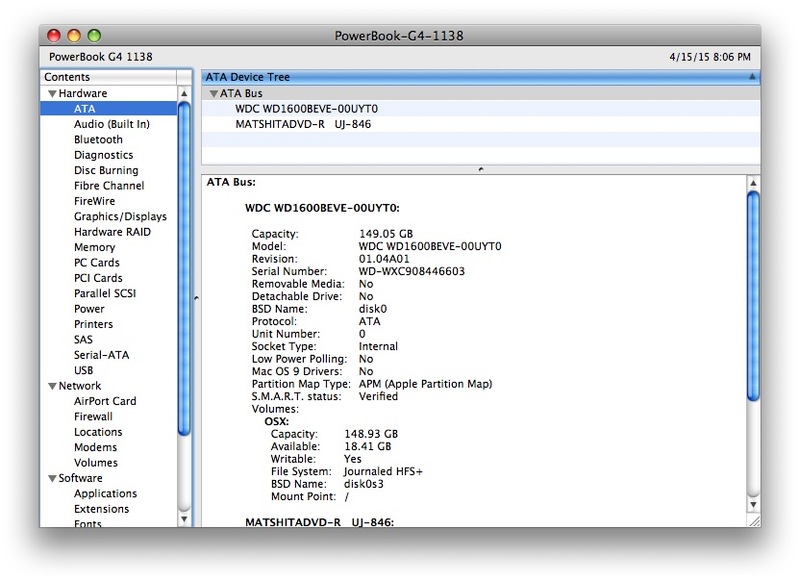 If you have an older MacBook Pro lying around, think about Snow Leopard for it … you will be glad you did. 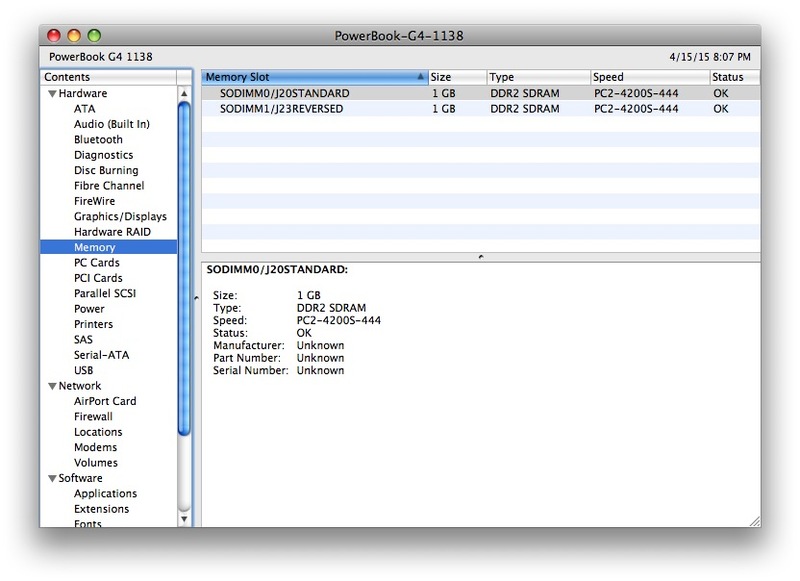 As regular readers of this blog will know, I have recently acquired a 1.67 GHz PowerBook G4, model A1138. Since I am already in possession of a G4 Cube that had been upgraded to a 1.2 GHz G4 by the seller, I thought it might be interesting to benchmark the performance of these two G4s using real world applications, vs. using a more formal but more artificial benchmarking suite like GeekBench. Both were loaded with Mac OS X 10.5.8 Leopard and so a fair fight seemed in the offing. At first glance, this should be a case of “no contest”. The PowerBook should be the clear winner. The CPU is nearly 40% faster, the RAM is more than five times as fast (533 MHz vs. 100 MHz), AND there is more of it, and finally the disk technology is 5 years younger than its peer on the G4 Cube. As the icing on this particular cake, the graphics cards are grossly mismatched as well: a 128 MB ATI 9700 in the PowerBook, but only a 32 MB nVidia GeForce 2 in the Cube. As you can see from the numbers above, a curious thing happened on the way to “no contest” – the results got inverted! Inexplicably, the older, slower and less powerful G4 Cube trumped the newer, faster and (at least on paper) more powerful PowerBook G4! How could this be? I quickly realized that two salient differences had not been accounted for in the lineup of specs I presented above. Firstly, the G4 Cube’s CPU is equipped with 2 MB of L3 cache, while the PowerBook’s G4 only has 512 KB. That had the potential to make a big difference, perhaps even neutralizing the putative 40% speed gain of the PowerBook over the Cube. Further to that, I failed to account for the fact that I had upgraded the G4 Cube’s hard drive with a new and fast 320 GB ATA-100 drive. This drive was not just fast, but also had 16 MB of onboard cache vs. the PowerBook disk’s 8 MB of onboard cache. 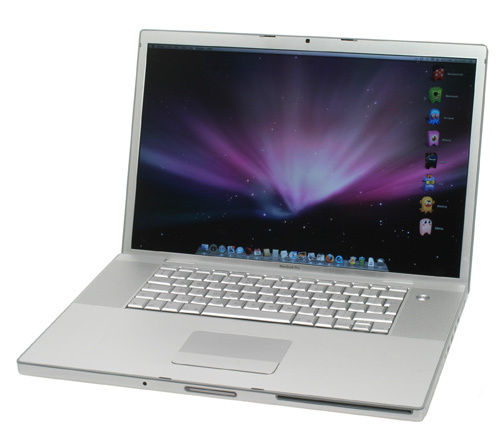 Finally of course, we must not forget that as a notebook, the PowerBook uses a slower 5400 RPM hard drive, vs. the Cube’s desktop class 7200 RPM hard drive. Since all of the metrics above relate to loading large amounts of data (programs and OS) from the hard drive, perhaps the skewing of results in favor of the G4 Cube was strictly a function of its faster hard drive and more disk cache? What about the CPUs? Did the Cube’s more generous CPU cache also contribute to the unexpected results above? How would the two machines fare when the task was CPU bound, not disk bound? Here we get the “expected” result. In CPU bound tests, the Cube’s slower G4 was significantly outperformed by the PowerBook’s higher spec’d counterpart. Unexpectedly however, the onboard cache difference did not seem to provide the Cube with as much of a performance boost as I had anticipated… or had it? Clearly the extra L3 cache improved the Cube’s performance in the above tests, but not enough to neutralize the significant clock speed advantage that the PowerBook had. Returning to the question above (“did the Cube’s extra L3 cache contribute to its superior performance in the OS and application loading tests?”) the answer is … probably. Just how much is hard to say, but loading either OS code or program code requires a fair amount of CPU, and so it is reasonable to assume that some part of the Cube’s OS/program loading performance results can be attributed to the extra L3 cache. So, what do we conclude from all of the above? Well, the fundamental takeaway is that in real world testing, G4 clock speeds are not the best direct measure of how well a machine will perform for you. Disk speed, disk cache and CPU cache are all factors that must be taken into account. Secondly, and particularly in subjective evaluation of boot times and program load times, disk rotational speed and disk cache depth are significantly more important than CPU speed. There you have it then, a tale of two G4s. Something of a tie between the two, but one that delivers some important lessons on what really influences real world performance. 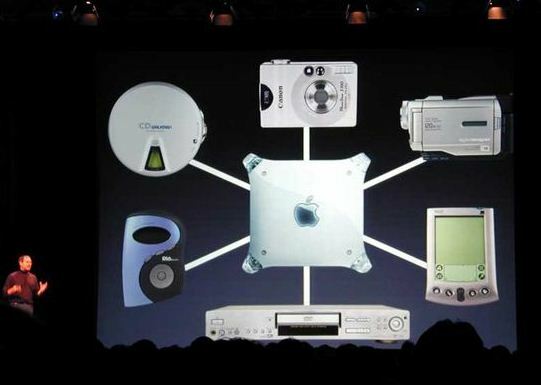 On January 9th 2001, at the annual Apple Worldwide Developers Conference, Steve Jobs announced that the personal computer was entering its third great age, in which its’ previous roles as productivity platform, and then as internet platform, would be superseded by a new role, that of the “home digital hub”. In this new role, the personal computer, and the Macintosh in particular, would enrich our experience of the increasing proliferation of consumer electronic devices by augmenting the capabilities of those devices with the computer’s powerful processing, extensive storage and large display. This turned out to be an amazingly prophetic vision. 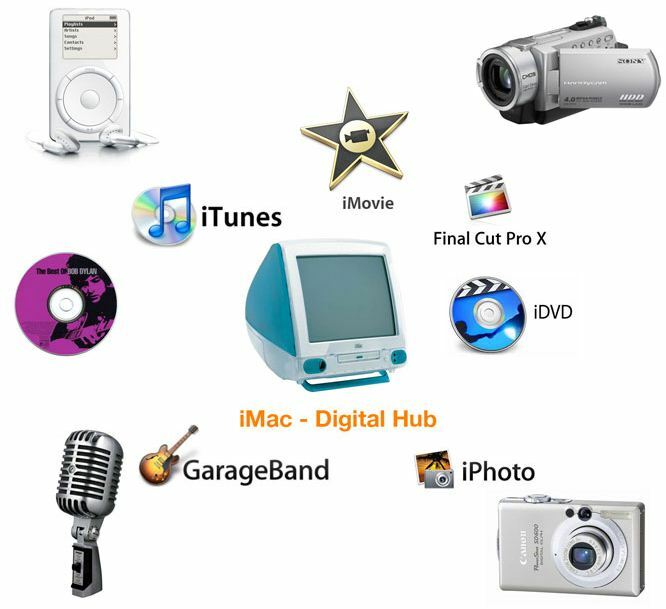 Over many of the recent posts in this blog, we have been exploring the interaction of the Macintosh and many of the consumer electronic devices Steve mentioned as part of that address, and a few devices that he didn’t mention, such as the iPod, which was not yet available in January of 2001. The combination of consumer devices with the Macintosh, its applications and its display capabilities far exceeded what might have been accomplished by the devices alone. In this case, one plus one did equal three. Steve was right, and the Macintosh evolved into an incredible digital hub. Digital Cameras: In an earlier post, we saw that digital cameras, coupled with USB card readers, image editing applications such as Photoshop and image viewing applications such as ThumbsPlus, allow us to capture, manipulate and view digital images with ease. Scanners: In a similar way to digital cameras, we have seen that the combination of the Macintosh and Hamrick Software’s VueScan application allows us to capture, manipulate and view scanned digital images with an ease equal to that of camera-based digital images. 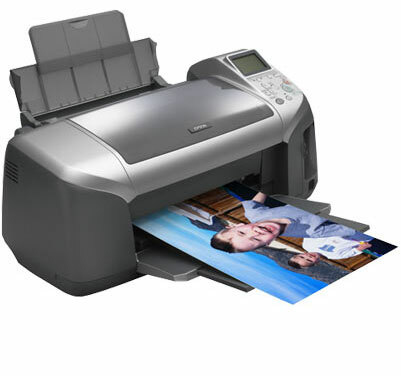 Printers: We haven’t looked at printers in the “pages” of this blog, but the Macintosh of course supports a wide range of printers, both document printers and photo printers. Did you know that the first truly successful mass market laser printer was the Apple LaserWriter of 1985? Again the digital hub paradigm multiplied the value of this product. The LaserWriter printer, coupled with the Macintosh and the Aldus PageMaker application, become the first major desktop publishing success story. 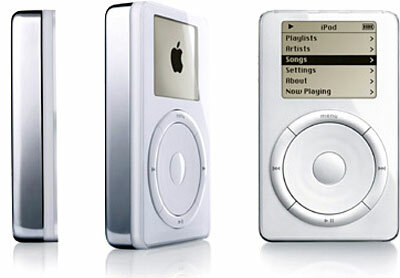 MP3 Players: The iPod instantly leaps to mind when discussing this class of consumer devices, but the iPod did have a few early rivals, and the Macintosh supported most of them as well. Combining the Macintosh with a music management application like iTunes and a high capacity MP3 player like the iPod yielded consumer magic – 1,000 tunes in your pocket, all easily managed and controlled from a central intelligence (iTunes) on your Macintosh. Music CDs: Speaking of consumer magic! 🙂 In the 1980s and 1990s, the now humble CD was magic! How does this relate to the Macintosh and the digital hub idea? Easily! The Macintosh fully supported playback of those magic CDs directly. 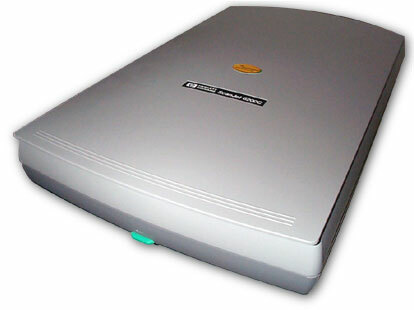 This was not unique to the Macintosh of course – PCs did it too – but it was a useful addition to the Macintosh multimedia arsenal and many a CD player application emerged to meet this need. Sound Recording Devices: While we are speaking of things that play back sound, how about things that record sound as well? Yup! The vintage Macintosh supported this as well, and the digital hub concept multiplied the value a hundredfold. The simple microphone was the easiest implementation of a sound recording device, but available implementations spanned the gamut of complexity. As an example, a 68040-based Quadra 840AV, equipped with a Nubus DigiDesign AudioMedia II capture and playback card, and coupled with DigiDesign’s ProTools application, was almost literally a full audio mixing studio. Sound Editing Applications: A quick troll through the Macintosh Garden “Music and Sound” category reveals dozens of audio editors, including my personal favorite, Audacity. Combining these applications with sound recording devices yielded limitless flexibility, dramatically enhancing the capabilities of the audio capture devices themselves. 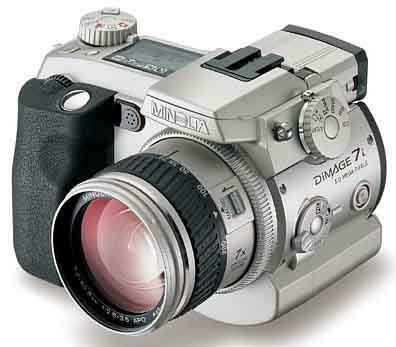 Video Cameras: As shown in earlier posts in this blog, the vintage Macintosh was a more capable video processor and viewer than many people might think. 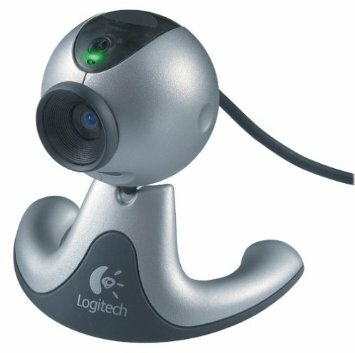 As we have seen, the Macintosh very capably supported webcam based video late in the Mac OS era, with Mac OS 9.1 and Mac OS 9.2 providing the best support. A variety of applications rounded out the offer, with the HappyMacs Seal of Approval going to BTVPro, which did an excellent job in this area. For non-webcam video, Apple’s own iMovie debuted near the end of the Mac OS 9 reign, and did a reasonably good job as a video editor and viewer. Video is a very demanding media form, and the faster the processor, the better the support feels subjectively. Video on a 200 MHz Power Macintosh 7300/200 was not exactly fluid, but move up to a 700 MHz or greater machine, and the experience became quite usable. 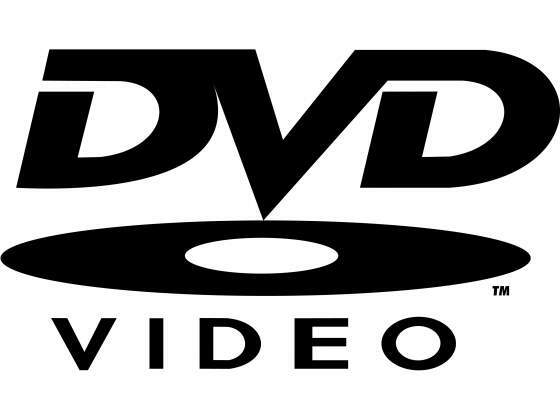 Video DVDs: We should not forget to mention the now fading video DVD. 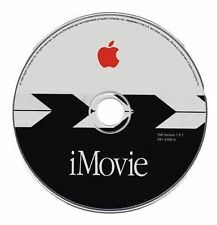 Like the audio CD, the DVD was another piece of consumer magic in its time, and the Macintosh fully supported playback (assuming your Macintosh had DVD drive hardware in it). Apple’s own DVD player application did a nice job here, as did many other similar applications. Other Media Devices: Finally, the vintage Macintosh either directly supported, or could be retrofitted with, USB and Firewire ports. From the G3 iMac onwards, these were standard capabilities. Prior to that, they could be retrofitted by adding the appropriate expansion cards. Via these two general purpose interfaces, an unending variety of other media devices and sources could be attached, limited only by the imagination and product availability. So there you have it: MP3 players, music libraries, music CDs, webcam video, DVD video, video editing, digital cameras, image scanners, digital image editing, document and photo printing, microphone and direct audio capture, sound editing/processing/mixing… the list seems to go on and on. Steve Jobs was right. The personal computer did enter a third golden age, that of the home digital hub, and is arguably still in that age as of this writing. The vintage Macintosh was, and remains, an amazing multimedia device, capable of acquiring and working with almost every form of media that can be imagined. A G3 or G4 Macintosh running Mac OS 9.x may not be today’s “flavor of the day”, but it is still an incredibly capable multimedia platform. Hats off to you Steve, for the foresight to see this all so clearly and so well before it became a full reality. Without really intending to, I have become increasingly intrigued by Gopher. As the web gets ever denser, ever more cluttered and ever more complex, Gopher continues to tunnel along in sublime simplicity. No jarring ads, no pop over / pop under windows, no video crawlers clamoring for your attention… just pure content. All the content, all the time, and nothing else. I love the elemental simplicity of it all. I have decided to create a Gopher space of my own to serve the Happy Macs community. Over my many years of involvement in the world of vintage Macintoshes, I have built up a sizable and (I think) impressive archive of Mac OS Classic software packages. Many of these are of course available from some of the larger and better known vintage Macintosh archives on the web, but many are not, and some of them were more than just a little difficult to unearth. I plan to make the full collection available via this new Gopher space, along with my equally large archive of Mac OS X PowerPC titles. I hope that the publication of these archives will be of some assistance to those interested in vintage Macs. The new Happy Macs Gopher space will be a longer term project, likely taking many months to complete. I am investigating Gopher hosting right now with traditional web hosting companies that might allow me to install and run a Gopher server alongside their more “traditional” web server offers. As an alternative, there is no shortage of viable computers here at the Happy Macs lab – I may simply put one of them on the net and host the site directly. All of this will fall out of my ongoing investigation. Development of the site will be easy enough. Gopher is fairly easy to learn and as an added bonus, my earlier posts on networking have had the happy side effect of leaving me with a fully functioning NetPresenz server loaded and running on my Mac OS 9.1 powered 7300/200. NetPresenz includes a full Gopher server, and so I should be able to do the site development completely within the safe confines of my own LAN. Eventually, I will publish the finished gopher space via either Gophernicus or Bucktooth, the two best known current Gopher servers. This is a few months down the road however. In the meantime, I will keep you posted from time to time on how things are progressing. Wish me luck in the new and subterranean world of gophers! After I completed the work recorded in my previous post “Sorting Photos on iPhone, iPad and iPod”, I noticed that I had a few stragglers – photos that were still not sorting correctly on my iPad. I looked into this, and quickly discovered that for whatever twisted reason, the iTunes/Photo app pair seemed to be clinging stubbornly to any date they could find embedded in a photo that would mess up the obviously intended, filename-based, sort order. In this case, it was the XMP data, another set of metadata that can be inserted into image files, often by photo editing programs such as Photoshop, Lightroom and the like. The net result for me was five photos that just would not sort properly, and all because they had a date recorded in their embedded XMP edit history that reflected the date upon which I had last edited the picture in Photoshop! The iTunes/Photo app pair, for whatever reason, were seizing onto THAT obscure date, and using it to set the sort order whenever it differed from the other embedded dates in the file. Sheesh! Apple seems to have gone out of their way to make this as difficult as possible! I applied the rather draconian fix of simply deleting the XMP data from the offending images (actually, from all of my images in fact), and that has resolved this particular sorting issue. Happily, the same exiftool that was used as the workhorse in my last post was also the mechanism by which I achieved the XMP data removal, and so there is no need to acquire any more tools to accomplish this latest step. Convert all PNG files to JPG before proceeding. Ensure that all photos have a filename that includes a representation of the date, such as “2014-10-14.01, A Great Photo.jpg”. That’s it. The images in the folder named “directory_name” should now be sorted more or less correctly in the Photos app after being downloaded to your iPhone, iPad or iPod via iTunes. I say “more or less” because I have observed that while the above recipe seems to sort things correctly into date order, it still doesn’t sort them into time order within a date. So, within a given day’s photos, the images are still sorted in a manner that defeats my limited cognitive abilities. If and when I figure that little issue out, I will record it here in another post. 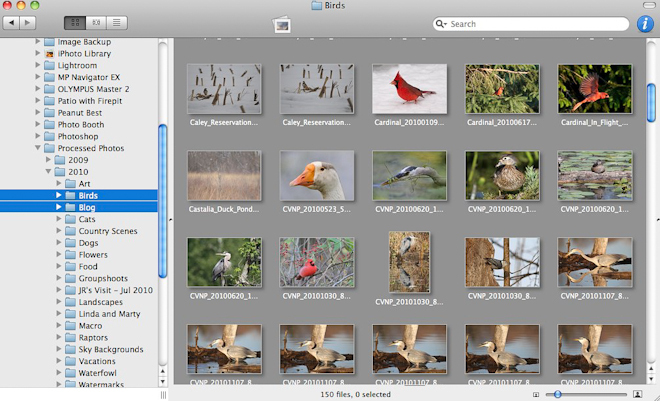 Until then, at least the photos are sorted into a semblance of proper order. For the record, I will note that none of this is an issue in the Android ecosystem. On my Samsung Galaxy Note 3, after downloading my image library to the device, I can view the photos in any of a dozen different photo applications, and they always sort into proper order, based on the filename. The above is a purely Apple issue. As you will know if you have visited my companion blog, “Quadras, Cubes and G5s” (happymacs.wordpress.com) I am a long time Apple “fanboy” and so it pains me to say that this particular experience is better on Android than on iOS, but those are the facts, and I have call it like I see it!